There's really nothing quite like this in other collections of "primitive" art, or even in the grand narrative painting from the European tradition. 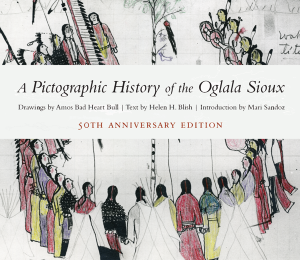 A landmark presentation, the original 1967 version of A Pictographic History of the Oglala Sioux presented sharp reproductions of a collection of drawings depicting the experiences of Plains Indians in the second half of the 19th century, alongside a detailed explanatory text which was in part informed, as the drawings, by participants of the events portrayed . This 50th anniversary edition improves on the earlier version by sourcing many of the images to the original glass plate negatives of the reproductions, which had surfaced in the 1980s. The edition endeavours to utilize modern techniques to enhance the overall quality of these astonishing images and faithfully reproduce the attendant text, while also allowing the cumulation of decades of research since the original manuscript to respectfully deflate some of the attendant legends, and clarify details with the latest understandings. The result is one of the finest accounts of the life and times of these storied peoples available anywhere. One of the interesting facets of the publication is neither of the principal authors had ever met, and each had died long before the first edition released, without any reasonable expectation or knowledge that their work would ever be published in form available to a wider public. The artist, Amos Bad Heart Bull, died in the year 1913 on the Pine Ridge Indian reservation where he had lived for over three decades. The writer, Helen Blish, who first encountered the drawings in 1926 in the possession of Bad Heart Bull's sister, passed away in 1941. While Blish's efforts had proved crucial in administering the photographic reproduction of the original drawings, her academic manuscript was never necessarily planned to be paired with the drawings as a distinct volume. It was really the retained memory among a small group of colleagues -- of Blish's work as well as the fine quality of the drawings -- which kept a potential realization of the wider dissemination of the Bad Heart Bull drawings a possibility for many years, beyond even the loss of the original drawings themselves. Amos Bad Heart Bull was born in 1869 and spent his early childhood living in the traditional Lakota Sioux way across parts of what would later be known as South Dakota, Wyoming, and Montana. Although the 1868 Fort Laramie Treaty had formally recognized title to this region, economic opportunity tied to the Sioux's resourceful territories ensured steady pressure and encroachment by settlers and opportunists, and the US army could not or would not enforce compliance with terms of the Treaty. After the subsequent discovery of gold in the Black Hills, politicians in Washington thought it simplest to insist the remaining free-roaming Indian tribes be relocated to designated reservations. As his band joined others holding out against these edicts, Amos Bad Heart Bull experienced first hand the eventual dissolution of his people's freedom. By age 12, his family had accepted reservation life, eventually settling at the Pine Ridge reservation in South Dakota. How his artistic talent had developed is not known, but he purchased the ledger book which would hold the drawings in the early 1890s during a time when he was employed as a scout for the Army. Serving with him was his uncle Short Bull, famous for his exploits with the great warrior Crazy Horse, as was another uncle, He Dog, and too Bad Heart Bull's father, who was also the band's official historian. The book began to fill with drawings of historic encounters, as recounted by the older men, and also, uniquely, social rituals and practices of life before the confinement to the reservations, and also some of contemporary events. Bad Heart Bull's drawings were of innate quality, compositionally and in the depiction of action. Blish, born in 1898, grew up in proximity to a number of Indian reservations as her father was employed by the Federal Indian Service. In 1916, the Blish family was relocated to the vicinity of the same Pine Ridge reservation in South Dakota. Informed by her close proximity and experiences, Blish developed an academic interest in ethnographic research shared with colleagues at the University of Nebraska. This interest would eventually lead to meeting Dollie Pretty Cloud, the sister of Amos, who was said to be in possession of a most extraordinary book, left to her upon his death. Blish would eventually write a thesis based on this work, consulting some of the then elderly men who had guided the drawings. She was also able to convince Dollie to allow the volume to travel to Lincoln, Nebraska to be carefully reproduced in photographic form. Blish concluded her Master's Degree in 1929, and finally, in 1934, deposited with the Carnegie Institution the text which would be published three decades later. As described in Candace Greene's contemporary overview Significance of the Ledger Drawings, one of several new essays produced for this edition, Bad Heart Bull's work belongs to an artistic genre known as "ledger art", utilizing bound volumes of blank paper, often ruled and numbered, as became available from the 1860s onward when American culture and goods became more prevalent in the region. He seems to have consciously set about utilizing the blank pages as multiple canvases, a record of the then-living memories of his Oglala elders. This ledger book itself no longer exists, as it was interred with his sister on her passing in 1947. Therefore, "through the intervention of photography, Bad Heart Bull's record was converted from a physical book into a series of images that began to circulate in new and different ways." Blish, for her part, always worked from the original book, as she had arranged a sort of lease from Dollie Pretty Cloud so it could be thoroughly examined and notated. This work forms the bulk of the text, which includes translations of the written Lakota text which provides context on some of the original pages. Blish also created numbered identification for the individual drawings, descriptive titles, as well as fairly exacting commentary on specific content when appropriate. The introductory section first examines traditions of North American Indian pictoral art -- through petroglyphs, pictograms, and winter counts -- before examining the Bad Heart Bull manuscript as a historical document, as an artistic achievement, and lastly locating the work within Lakotan traditions. Acknowledging the importance of the work as a historical record, an attempt to "preserve the record of the life of a people" by setting forth "the record of manners, customs, traditions, institutions… giving a complete cross section of the life of his people -- social, economic, ritualistic, political, and military -- as he knew it" (emphasis in original), Blish also in the introductory essays sets out a case for the unique artistic achievement Bad Heart Bull's drawings represent, his work at once "a type of pictograph expression common to his own tribe as well as Plains tribes in general" but also a result of his own recognizable technique as he depicts "a conception of life as a state of activity, vigorously episodic… there is a naturalism and realism about his treatment which -- although it is based upon a crude and primitive technique and is naive and primitive itself -- puts life into the creatures of his pen and brush." Blish contrasts certain panoramic compositions, which she calls "miniatures" ("a glimpse of the episode from above and from one side… the picture of the action in its totality") with the more common "large-scale drawing" which isolates a specific action or activity -- effectively zooming in and zooming out -- which she argues constitutes a unique feature of Bad Heart Bull's artistic practice. Working together to represent historic episodes, the miniatures and large-scale drawings combine to tell a story visually and with remarkable clarity. Many of the more than 400 drawings hold great interest simply as visual composition. The artwork, as contained within the bound ledger book itself, appeared in a roughly sequential presentation, with the addition of numerous insert pages and many partial revisions carefully affixed overtop earlier work, a process of corrective editing by the artist himself. Most of the drawings were in color, an aspect unfortunately lost in the photographic reproduction which was limited at the time to black and white. There do appear nearly forty color plates, beautifully presented and printed larger on the page than the black and white reproductions. These were coloured by Blish's academic advisor Hartley Alexander working from select reproductions, with some of these renditions published in Europe in the late 1930s as part of a limited edition volume entitled Sioux Indian Painting. Blish herself made careful notes on the color schemes, included as an appendix. That what appears in this edition exists in any form at all is a minor miracle in itself. As Amos Bad Heart Bull was compiling the record over the course of 20 years, adding to and refining the details, he maintained focus on specific themes and largely kept the results grouped in specific clusters. For example, a detailed examination of the traditional Sun Dance (Nos. 9-15). Bad Heart Bull begins the series with a miniature showing the layout of the encampment around the Sun Dance grounds, and the positioning of the sacred pole. Another image itemizes various apparatus used in the ceremony, followed by drawings of various stages of the ceremony. Blish's notes translate the Lakotan explanatory text and add further context and description. This is a good representation of the ethnographic qualities of the volume, arrived through the combination of drawing and text. Such ethnographic features are exemplified by the following series of precisely registered drawings (Nos. 22-31) featuring the costumes and paraphernalia of various warrior societies. Many drawings are concerned with various skirmishes between the Sioux and their enemies the Crow. One remarkable group depicts in detail an event known as When They Retreated Into Camp (Nos. 219-284), which began as a horse stealing raid and became something of a protracted battle. Presumably through the recollections of Bad Heart Bull's father and uncles, a full accounting of various demises and when and where coup was counted as the skirmish raged over a great deal of territory is here presented. The details of clothing, weaponry, and even the decorative paraphernalia on the horses, combine with distinct expressions of action and movement mastered by the artist to provide an immediate account of individual experiences and events. There's really nothing quite like this in other collections of "primitive" art, or even in the grand narrative painting from the European tradition. Other sequences depict well-known historic encounters, such as the sixty drawings (Nos. 126-185) detailing the "Greasy Grass" fight (best known as the Battle of the Little Bighorn), of which Amos Bad Heart Bull had personal recollection being a child in the camps which came under attack from the U.S. 7th Cavalry. That this series features specific concentration on the initial charge along the river flat, led by Major Reno, is a function of the direct participation in the fight by the senior Bad Heart Bull and several uncles. The ability to incorporate personal experiences into the sequential record of the battle as displayed amounts to one of the finest historic accounts of this seminal event in American history. As it unfolds, the confident line of mounted troopers are engaged and routed by Sioux warriors who overwhelm the soldiers and cause a panicked retreat, a process clearly and unambiguously expressed through the visual technique of the artist. Another series (Nos. 192-198), commemorates an official conference held in September 1876 to discuss the future of the then-disputed Black Hills. This group uniquely combines textual lists, quotations from participants, a sketch of the figures around the negotiating table, and a miniature portraying the positioning of the attendant Indian bands in camp. Having effectively reneged from the Fort Laramie Treaty (1868), representatives of the U.S. government again negotiated with leaders of the local nations, who had little choice. Unsurprisingly, both sides had opposing notions of what this latest agreement actually represented. The tribal representatives believed they were arranging a temporary "lease" of the Black Hills to satisfy the gold prospectors, while the Americans assumed the negotiations were detailing the ceding of the territories and finalizing a process whereby all Indians would agree to surrender themselves to designated reservations. The inevitable acceptance of reservation life is expressed positively and personally, as Amos Bad Heart Bull portrays himself first at his job as an US Army scout, and then as a flag bearer during Fourth of July celebrations near the turn of the 20th century. In contrast, darker events such as the suppression of the Ghost Dance and the attendant Wounded Knee massacre are also portrayed. Blish struggled somewhat to situate this work within the artistic traditions as understood in the early decades of the 20th century. This record was more sophisticated than most examples of aboriginal "primitive art", although similar in many immediate aspects. Techniques of composition and perspective, associated with the European traditions, are likewise only partially suitable as analytical tools of Bad Heart Bull's achievement. Particularly in the extended sequences, these drawings are portraying sequential narrative events visually and across successive panels. In this way, this collection is something like a precursor to what would become known, crudely, as "comic book" art. That may hint of some wider circles of interest in this extraordinary volume.